It seems Shining Force Gaiden II actually uses 32KB SRAM. Source is here. Only found out the Wiki may be wrong after a friend of mine hit issues testing games in MESS. Thank you, that looks like a mistake indeed. I added this 24 KB field on "Sat Apr 24, 2010 6:43 am". The probably reason is that I used Meka to naively confirm the save and for save size doesn't use a DB but instead it automatically adjust the .sav file to the nearest 8 KB. 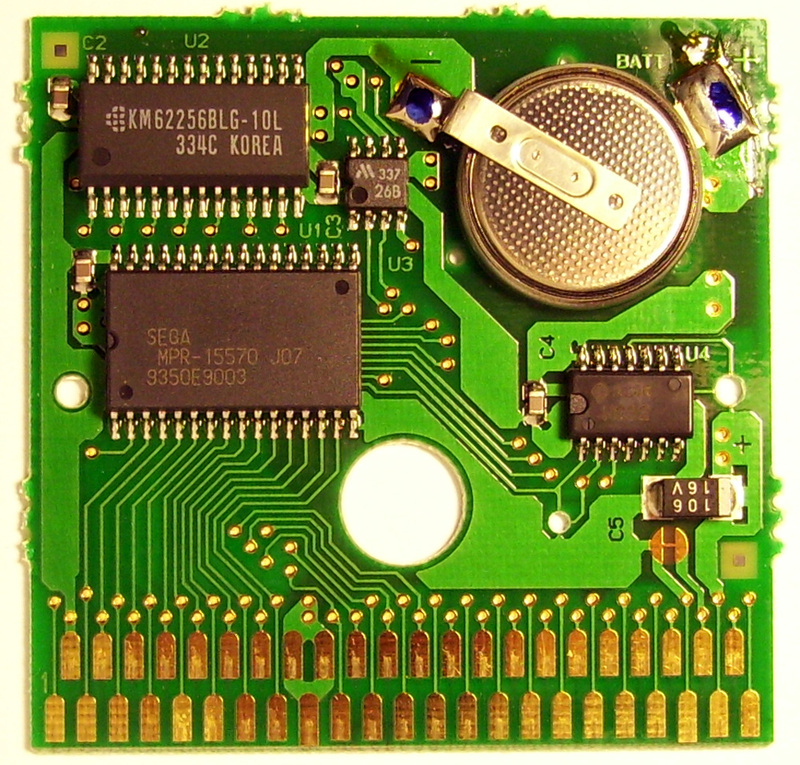 Given the bug above it is a fair assumption that the chip is 32 KB, tho I don't have a scan of the board handy. I have zero evidence and this is just a guess - but there is a small possibility that this sort of game could have e.g. 16 KB battery backed and 16 KB only for stratch memory. A board scan would help to confirm. This would appear to be a photograph of the board. I recently finished SMS Incredible Crash Dummies and I have the feeling that there are only 4 levels of difficulty (EASY, OK, HARD, VERY HARD) and not 5 * 5. May I have missed something ? For SMS Asterix, it takes 21 levels to finish the game, but should not we also count the alternative levels between Asterix and Obelix ? It seems in "Tournament Mode" you can play with 4 players. balkry, use your best judgement to edit pages, no need to ask for confirmation. "Games with this tag only work correctly on PAL (50Hz) systems - they fail or are glitchy on NTSC (60Hz) systems." Hi, today I received a copy of James Pond II from Portugal. On the box, there are several Portuguese stickers. It corresponds to version A of the scans we have. But the box is "Made in Australia", it's an OZISOFT. In addition the cartridge is RED and the notice is just one sheet in English. So I wondered if this version A was not finally Australian and not European as indicated ? Is it a normal size box? Same height, 1 or 2 millimeters less in width and 1 millimeter less in thickness. I do not have an Australian game in my collection, so I can not compare. But the inlay is smaller. I guess it's probably Australian then. Hey, there's an article I can't edit with an outdated Charles MacDonald link. The 512k Flashcart tutorial is a broken link here, but I can't find it on his new site. It exists on Archive.org, however. I have changed the year of release from 1992 to 1993 for WWF WrestleMania Steel Cage Challenge SMS. I have changed the year of release from 1992 to 1993 for Batman Returns SMS. and Mean Machines Sega 06 UK 1993 claims it will be released in March. I have changed the year of release from 1993 to 1994 for Micro Machines SMS. and Mean Machines Sega 17 UK 1994-03 claims it was released in January which would explain the back cover discrepancies. I have changed the year of release from 1988 to 1989 for Altered Beast SMS. I have changed the year of release from 1990 to 1991 for Back to the future II SMS. A preview in Sega Power UK 22 9-1991 that states it will be released in October. I have changed the year of release from 1991-2 to 1992 for Back to the future III SMS. A review in Sega Force UK 04 4-1992 that states it was released in Feb and that the game was"crap"
I have changed the year of release from 1990 to 1991 for Castle of Illusion - Starring Mickey Mouse SMS. A Review in EGM 19 2-1991 that states it will be released in February. I have changed the year of release from 1990 to 1991 for Cyber Shinobi SMS. I have changed the year of release from 1990 to 1991 for Danan Jungle Fighter SMS. 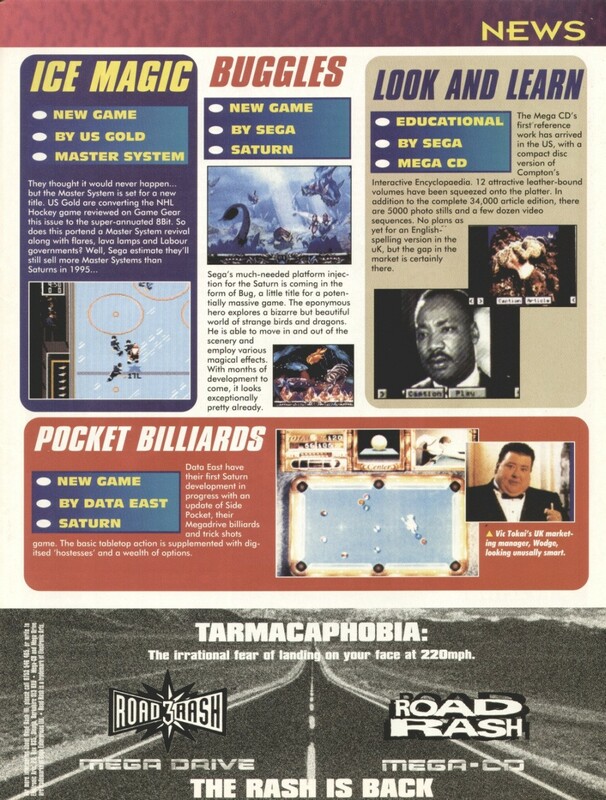 Back cover of the US game has copyrights of 1988,1989 and 1990. It looks like there was a US version planned for released nov 1992 but I guess this never materialised. Back cover is full of 1993 copyrights. Back cover has copyrights for 1991. Thanks for those BIG D and the details. They seem to be mostly Year N to Year N+1. Many of the dates here were based on title screen date so it would make sense that many were released later.